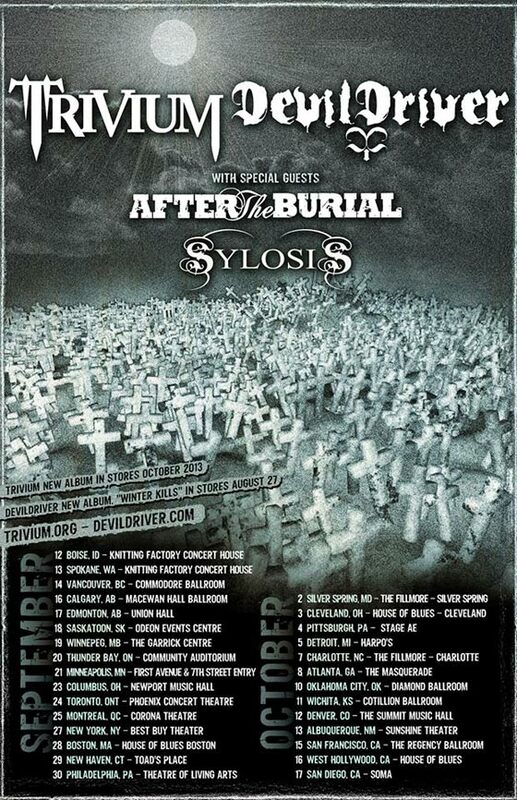 A few days ago the chaos began to unfold as metal hot shots Trivium and DevilDriver embarked on a 29 stop tour across North America with special guests After The Burial, Sylosis, and Thy Will Be Done (Sylosis is only playing the first part of the tour and Thy Will Be Done will only be playing the second). With DevilDriver having a recent album release and Trivium launching one in October, this is the perfect opportunity for you to experience both of the band’s new music first hand. Do not pass this up, you will be sorry if you do! Pre order bundles for Trivium’s soon-to-be released album “Vengeance Falls” are available here.